It was Friday morning. I woke up, took a shower, got dressed, ate breakfast, and got ready to go to a Toastmasters meeting. I love going to these meetings. It is generally an uplifting environment... but then I deal with sensory overload when I get home. Many times I feel like I picked up everyone's thoughts and emotions empathically as well, adding to my own. On a Friday night, I attended Art After Dark at Frames and Things to support some author friends as well as visit with them. Another person who was in the same car wore perfume and/or hairspray which assaulted my sensitive receptors. Sometimes, it may be other smells I am sensitive to. The music was louder than what I am comfortable with. I have never liked parties, nor have I liked going to concerts. I never liked the noise. This place is not much bigger than my apartment, doesn't fit a lot of people, and is enjoyable... until it isn't... when I begin to experience another layer of sensory overload. A group of people I know decided we should go eat out at a local restaurant... where multiple conversations take place depending on where individuals are seated... and the smell of food I don't like permeates my sensitive receptors. I went once but declined to go again. "Why?" they ask. But they don't understand the meaning of sensory overload. It was a simple trip to my local Walmart store. Thank goodness it is a much smaller store because this is a small town, so there are usually fewer people, and it is somewhat quiet. Until it isn't. Before I know it, over an hour had passed, and I head home... with sensory overload. Now, I order as much as I can online or pick it up at a Curbside service or ask someone to go to the store for me. I talked to someone on the phone (a friend or family member) for an hour and more. What a great conversation!!! (Which is why it lasted so long.) But then I couldn't turn the conversation off after I hung up. My head began to hurt with all the words that continued to get louder inside my head... as I experienced sensory overload. I go on Facebook to catch up with everyone I am friends with and see posts from all the pages I have liked. Within a short time, I feel overwhelmed. Too much information too fast. I get uncomfortable as sensations of agitation begin to increase, adding to the agitation of sensations of pain in my body. I volunteer as a secretary for an organization which meets once a month. Usually, 17-23 people attend. When everyone first arrives, there are a lot of separate conversations. These conversations echo off the walls. Before the meeting even starts, I experience sensory overload. When the meeting starts, the voices get quiet, and I work at focusing on the one or two speakers I need to take notes for. After I get home, I rebel against doing this task. I struggle with my need to have an important role by attending and providing this service vs. the sensory overload I deal with for sometimes days afterward. I go to the monthly potluck at my apartment complex. The same situation exists with multiple separate conversations bouncing off the walls of the community room. And I can't hear the person in front of me talking to me. But if I don't go anywhere, isolation will consume me and swallow me whole. If you know me and visit with me, I need you to understand why I need a lot of quiet time alone at home to recover. I may rebel for a few days and feel like not going to the next event. I often rebel against doing any more volunteering. When I'm in a room with many other people in it, I can't hear individual voices -- even the one directly in front of me -- if other people in the room are speaking. The other voices seem to bounce off the ceiling and walls, making their way back to my ears with overwhelming sounds and sensations. My brain has difficulty focusing due to competing sensory input. When I get home, I hear what feels like hundreds of conversations in my head competing for my attention. When it is intense, I can experience restlessness and irritability... which may spill over into triggering survival reactions in my body. As exhausted as I am when I climb into bed, even if I manage to fall asleep, I wake up in the middle of the night (to pee) but can't go back to sleep. Knowing I will most likely experience sensory overload in many different environments produces anxiety to the point I decide not to go. The next time someone asks me 'why' I don't want to go, I'll send them the link to this post. I put on one of my favorite shirts, however, this time, I feel a lot of pinpricks on my back as if the threads are made of thin wire and the seams are highly irritating. The fabric itself may feel irritating, too. The pinpricks become an itch, and the itch continues to spread. I can't stand the feeling of labels and cut all of them out. I finally found the term for this is tactile allodynia. My fingertips on the hand I hold my computer mouse with feels like I burned them on something hot. I Googled this issue and found that some people are extra sensitive to the EMFs of WiFi. If it is because it is a wireless mouse, I will try using one with a USB cord. The computer monitor is too bright for me. Fortunately, I found an inexpensive pair of blue-blocker glasses to wear over my prescription glasses. The good news is that I found out sensory overload is a known 'symptom' of fibromyalgia, chronic fatigue syndrome, generalized anxiety disorder, ADHD, and PTSD from past traumatic experiences... when it's difficult to focus and think straight because there is so much 'noise' inside your head. I used to take medication to calm down. I used to take medication to knock me out at night. However, I learned this is not a good long-term solution, and the medications have unpleasant side effects. I especially became aware that with sleep apnea, I do not want to be sedated through apneas. These days, I try to unwind before bed by applying Lavender oil on my spine and bottoms of my feet. After I climb into bed, I will 'upload' all the conversations and thoughts into what I call the 'mastermind' -- where everything exists -- a holding tank for all the thoughts and voices of the entire planet. Just like I turn off my computer every night, this is my way of turning off my mind. Most of the time I am successful. I don't have to keep my mind on all night fearful I will forget something important or worry myself into further despair. All my appointments are written down on my calendar. Important tasks are on the Task app of my phone. Inspiration always comes from a divine source. Problems eventually sort themselves out. The aftermath of a disaster will eventually calm down, and many people will discover strengths they didn't know they had and can even become heroes. I remind myself that I am a vehicle for the Creator of all that is to express itself through. "I" don't have to hold onto anything. "I" am not writing this post. "I" can go to sleep and let this expression decide what it wants to do in the morning... which all depends on how much energy I wake up with. As I get warm under my down comforter, I practice a meditation technique in which I climb inside my body and focus on visualizing brain synapses, nerve impulses, cells interacting, and blood flowing instead of all the voices I was overwhelmed with during the day. I will repeat this process in the middle of the night and early in the morning if necessary. Sometimes, I have to visualize thoughts, words, and concerns flowing down the creek outside my apartment. The water is always flowing... doesn't get caught up in staying in one place, holding onto thoughts, words, and worries. About two weeks ago, I experienced a manic high idea explosion, not for the first time. When these occur, ideas (thoughts) race so quickly, I am unable to sit and be with any one of them long enough to take action. I also have flash visions of my completing them all. Maybe I have in an alternate life. Due to memory issues, I'm sure I've written all these ideas down somewhere before, but who knows where. I've saved I think thousands of digital files in both downloads and on Pinterest. I Googled "manic high idea explosion" and once again, (I do remember finding this before), I came across bipolar. My highs are "less than fully manic" -- known as the term "hypomanic." "During an early manic phase of a bipolar condition, a person may become highly energetic, have a million ideas, become very talkative, stay up all night, ... and become very productive." Hey, at least this statement puts a number on all the ideas I feel like I have. A million! Plus, there is a marked "increase in goal-directed activity (purposeful behavior)" and sometimes, "physical agitation." For the agitation, if I remember to do so, I will start Tapping (EFT) and use some essential oils. For three days in a row, I woke up at 3 a.m. and couldn't go back to sleep. One of the known symptoms is "reduced sleep needs compared to normal." At least I know it won't last three months straight like it did in 2010. I like this description: subjective sensation of racing thoughts (often called a "flight of ideas"). Yes, to a flight of ideas... they fly by at what feels like the speed of light. I just ordered a blend of essential oils to help me focus. This next one describes my experience to a T: "distraction or derailment of thought occurring significantly more often than normal". I'm sure you all know what happens when bipolar swings the opposite direction. Fibromyalgia can do the same thing. Two big ones for me are: "Finding it hard to make even simple decisions" and "feeling extremely tired." And when I am extremely tired aka fatigued, I don't feel like doing much of anything. At the very worst, I have felt completely hopeless, inadequate, abandoned, and yes, twice that I can remember, I've considered ending my life. Most recently, Abraham-Hicks came to the rescue by explaining that we all WANTED to incarnate in physical bodies here on earth because we desired to experience the creative process of manifestation with the power of our thoughts and emotions. If we end our lives, we will make the same decision all over again to come back for more. The key is to find FUN in as many activities as we can which will ALLOW the magic to happen. (Law of Allowing.) And if we find ourselves in a funk, climb up the emotional guidance scale one step at a time. OK. I must admit that I have managed to manifest some amazing things, people, and situations in my life. Perhaps I decided this time to put a bit of spice on the process by experiencing bipolar episodes. In the meantime, one of many books I've collected over time called my name as I looked at the bookshelf in the hallway. I must have had a feeling I would need it when I found it. And part of manifesting is divine timing. "Just as an athlete cannot perform optimally without endurance, you cannot expect to achieve a superpower brain without being able to laser focus your mental energies. In order to do this, you must successfully manage 2 key factors in our current culture: distraction and multitasking." Distraction? Multitasking? All day, every day! We live in a crazy, overwhelming time when information overload is intensified by social media. Have no fear... on page 4, I found hope. "Let's look briefly at 3 of the important functions we'll explore in this course. The first is attention, which means focusing the mind on one thing at a time." I feel a sense of excitement at the prospect of learning how to focus on one thing at a time. :-) I also wonder whether it is at all possible. Perhaps, I wanted more than the ability to create. Perhaps I yearned for knowledge. Each time I stumble upon something I am interested in learning, I feel inspired. Oh, yes, I also want to learn how to read music, draw, create digital art (with a drawing pad that connects to a computer), and I want to do it all at the same time. Haha... good old hypomania! 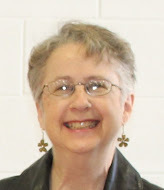 Author Connections: Can't I Write Off My Expenses? I listened to a number of book marketing webinars, courses, read articles, and more. While I still felt discouraged, I also realized I had unrealistic expectations. Yes, my books are available on Amazon, but so are millions of other books. 1. You have a coaching or other business/profession, and your book relates to your coaching or business/profession. 2. You are often invited to speak at events and sell books at these speaking events. 3. You create a course based on your book (and have buyers). 4. You have a network of people who have a huge mailing list (email) and support you by (emailing) everyone on their list about your book. 5. You are already famous. 6. You meet someone who is famous and loves your book. 7. You are good at marketing or you have the budget to hire a publicist. 8. A movie producer wants to invest in turning your book into a movie or TV show. Even if you have one of the above, the costs involved in getting your book into print may far exceed what you will ever get in sales. Think going to concerts, ballets, out to eat, decorating your home, and shopping for clothes you will only wear once. It is best to invest in your book as an experience without getting caught up in the money aspect of it all. Since I started out on my author journey, here's what I have learned. 1. Don't make your books about money. Make them an AVENUE TO REWARDING EXPERIENCES AND CONNECTIONS. I have met many wonderful people at local author events, some of who have become friends. If I felt up to traveling, I could participate in many more. I talk to other authors, and we share information among each other that can be of benefit to either us or someone else. I've learned about all the different publishing companies who took thousands of their dollars to get their book into print. I have met writers who are thirsty to get their book published but don't know how or where to begin. It feels good to pass information onto them. 2. Unless you make a profit within five years of publishing (after all your expenses), the IRS determines this as a hobby. You can't just buy a new computer, software, and printer with the hope you can write it off on your taxes. The same applies to paying for editing and other services. By all means, save all your receipts just in case you DO sell a lot of books. If you have a regular accountant or tax preparer, you can get more information from them. Think of someone who loves to knit or crochet and buys yarn, totes, hooks, books, and more. Think about the artist who invests in canvases, paints, brushes, and other supplies. Maybe the artist loves digital, so they invest in a computer, software, and a drawing pad. Think of someone who loves photography and buys a new camera, lenses, tripod, computer, software, and more. Same with quilting (think buying an expensive loom, quilting machine, and many different pieces of fabric) and wood-working (buying all the tools), etc. In the meantime, you make gifts for family and friends. Maybe you sell some of it on Etsy or at local markets. You meet other people with similar interests and make new friends. I found an art gallery and framing business in the next city that holds an event on the first Friday of every month. At each event, an artist or two is featured. On the same night, there may be a photographer, author, and musician. I look forward to mingling with all the talented, inspirational people. I make new rewarding connections and enjoy being around a lot of creative people. And yes, if I felt up to traveling, I'd participate in many more events. There are many writers conferences being offered -- some that also have agents. You will pay to go to these, and travel is often required. Think vacation. If you were to go to Hawaii, you'd pay for airfare, hotel, restaurants, a rental car, taxi service, etc. You go for the education and experience. A note on agents: publishing companies want what is popular. Agents may like your book but expect you to rewrite it according to what publishing companies want. I listened to a local author speak about her experience with agents. After rewriting numerous books according to agents' instructions, she finally found a publishing company who accepted her book the way she wrote it. Write because it is fulfilling like an artist paints for fulfillment. Yes, there are some artists just like authors who made it to fame. Keep creating. Keep dreaming. Keep networking. I am curious. Did you play in competitive sports when you were in school? Did you ever get hurt? I bet when you did, you got right back up into the playing field again. Some kids play in competitive sports from the time they are really little. They get pushed, shoved, hit, thrown, get bruised, break bones – and get right back up and play again. I wasn't one of them. Maybe you were like me – one of the kids who was bullied in school, had an older sibling who intimidated you, and a father who assaulted you with degrading words, so you grew up feeling worthless. I was traumatized each time I got hurt physically or emotionally. One time, I was riding my older sister's big bike when no one was looking. I didn't know the brakes didn't work and couldn't slow down when I came down the hill and turned the corner, making friends with the stone wall. I sprained both my wrists in addition to the other scrapes and bruises the bike and the wall decorated my body with. I'm sure I suffered emotional wounds as well. When I was 21, I dozed at the wheel and opened my eyes just in time to see the parked car I was about to crash into. My Fiat folded like an accordion and I sustained a whiplash, concussion, and a lot of bruises – especially where the seat belt was – across my chest and hips. A 19-year-old boy I was infatuated with had just broken up with me, so this emotional trauma was layered on top of the physical injuries. When I was 36, I lost control of my Toyota and jackknifed sideward into a bus bench that was cemented into the ground after a lady driving a Mercedes clipped the back, right corner. I couldn’t walk for months. At the time I had this accident, I was an emotional mess in the midst of a volatile relationship with a narcissist. Once again, trauma was layered on top of physical injuries. It seemed like the injuries I collected never healed, which contributed to the chronic pain condition the doctors diagnosed as Fibromyalgia. They were very generous with all the drugs they prescribed to me, and by the time I was 43, I couldn’t work anymore and found myself on permanent disability. When I joined Killeen Toastmasters in July of 2015 at the ripe old age of 59, I began to get a different kind of education. I heard stories from fellow members about all the adversities they’d faced and how they were dealing with them…especially from Tim. And I couldn’t use the excuse that I am a female because I met women like Anca, who was a professional boxer, and Rolana and Delsina who were in the army. I began to wonder… what do they have that I don’t? Some people become firefighters, police officers, first responders, go skydiving, skiing, go bull riding, go into the military, and volunteer for rescue missions. They face danger, get hurt, recover, and go face the danger again. I wanted to know HOW. I began to do some research, found some books, and I believe I finally figured it out. It’s the relationship between Trauma and Resilience. In Dr. Peter Levine’s book, Waking the Tiger: Healing Trauma, I learned that trauma, especially in early childhood, programs your brain and nervous system to stay in survival mode – always on alert – because you never feel safe. Because of this, you don't get the rest and repair cycles you need to heal. I found data showing that most people who have had adverse childhood experiences, also known as ACE, develop autoimmune diseases, chronic pain, adrenal fatigue, depression, anxiety, and PTSD. I found out I am not alone when it comes to ACE. People who have suffered from ACE become afraid of everything. Fear attracts more situations to be afraid of – like the abusive relationships I blindly walked into. It makes you jumpy because your adrenals are constantly being ignited – and rarely for any good reason. I've been making some progress – investigating ACE and watching for ANTs around fear (automatic negative thoughts). The main ones are convincing my brain that the pain in my body is not dangerous – which in my case it isn't – and developing a sense of safety and self-regulation. I am easily triggered into a PTSD reaction with my heart pounding, back spasms, and exhaustion. I hope to find a way to regulate my nervous system in the near future to stop the vicious cycle of fight or flight so my body can rest and repair itself. In conclusion, if you're like me, dealing with PTSD, fear, auto-immune disease and/or chronic pain, look into ACE and Resilience. You may be surprised what you learn about yourself, the people you grew up with, and the people you know now. For the past number of months, there is often a solo bee that flies really close to me yet not quite landing on me. I was feeling a bit unnerved. After all, I had been stung by a bee when I was a little girl. 'It' was at the Walmart parking lot -- several different days, even to the point of trying to join me in my car. However, I didn't want it to be inside the car with me, and I had a hard time getting it to go away. When I got home, 'It' was there again waiting for me. What on earth? 'It' was also in the parking lot of other stores I recently visited as well as a restaurant. What about me was attracting bees? 'It' was really close several different days when I was riding my mobility scooter outside, down to the community room of my apartment complex... and wouldn't go away. 'It' is either flying around my front door or my back door. I began to think it was the same one appearing everywhere as it is the same size. I Googled the metaphysical meaning of a bee. Look what I found! This is so trippy! 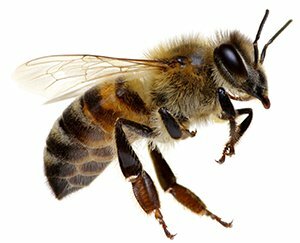 Now if I can accept 'It' wanting to be practically on my body and stop being afraid that it will sting me... maybe it is the same one and just wants to be my pet. If it is the same one, it teleports from one location to another. I know a few bee-keepers in town. If you're interested in reading more, click on the link below. 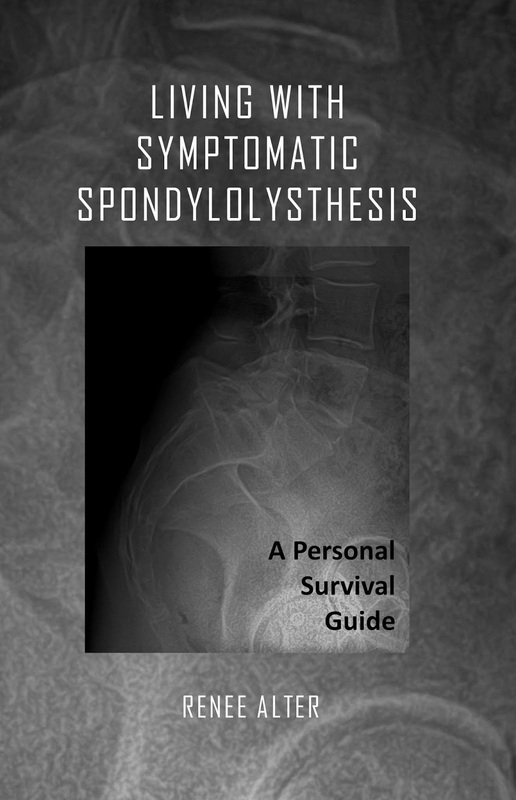 In 2005, Just before I turned 50, I found out I had Grade 2 Spondylolisthesis at L5-S1 which had been the source of most of the discomfort, pain, and problems I had with my back, hips, knees, and legs over the years. To date, I haven't had surgery. It is now 2018. I've been researching, studying, reading, taking classes, watching pain summits, listening to interviews by specialists, and putting into practice all that I've learned in pursuit of becoming my own advocate. I cover the multi-faceted topics I have learned and put into practice in memoir-style narration to serve as my personal survival guide as well as a book that others who have spondy can read and relate to. Photos included.